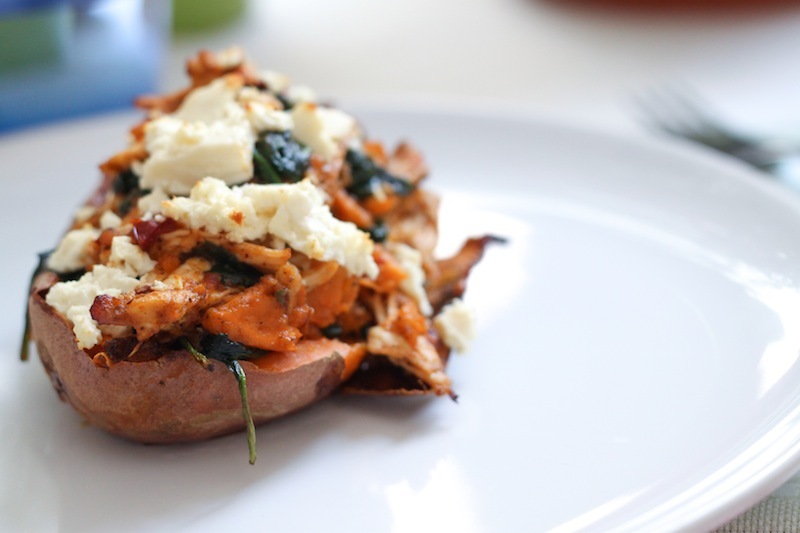 14 Days More: Spinach- and Feta-Stuffed Chipotle Chicken Sweet Potato Skins – Eat Me. Drink Me. Here it is. Fall. It’s been heading this way for a while, but I wasn’t paying attention to the signs. Maybe I didn’t want to pay attention to them. In Berlin, summer is a blink. And me, I process change so slowly, by the time I’ve come to terms with sandals and Saturdays by the lake, it’s already over. I bought a white crop top, and I never wore it once. “Don’t it always seem to go, that we don’t know what we got till it’s gone?” sang Joni, and this city seems to feel it. Berliners are slow to accept the death of summer. The cafés are packed with people sitting outside, stubbornly soaking in sun. But now all the chairs are lipped with fleece blankets to throw around your shoulders as the day wanes. Jacketed pedestrians clutch ice cream cones like a last defense. The parks are still full of families and the city’s effervescently hip young folk, but the babies are bundled up in hats and the hipster beanies are out for a walk. I love fall; it’s my favorite season. But this year, I can’t help but feel a little melancholy about these crisper days. I vowed to make more of my summer this year, and yet I find myself asking: Where did it go? Freely admitted, I’m a workaholic. But recently, I’ve been thinking about how unbalanced it’s making me. Balance has been on my mind a lot lately, from the way I approach weight loss to the way I organize my time. Yesterday, I crossed off every single thing on my to-do list. I accomplished everything I wanted to do in a day’s time, and still, as I was mid-way through cooking pumpkin soup (the last to-do item on my list), I found myself with some down time and thought: I could edit photos or send that email. It was past 6 p.m., and I’d been working since 8 a.m. The elation I’d felt at knocking out my to-do list was short lived. There was a new list to make, more things to tackle. But wasn’t enough enough? Why couldn’t I just be happy and call it a day? I just finished reading The Paradox of Choice by Barry Schwartz, and I fear that I’m the worst kind of maximizer, someone who needs to be the best but is paralyzed by all the different ways in which that might be achieved. What if I picked the wrong path to best-ness? Barry says that people like me have a tendency to focus on the negative rather than the positive as we simultaneously push ourselves harder and further to achieve more… and more… and more. But nothing is ever enough. As soon as we’ve reached one goal, we’re instantly on to the next one. He recommends gratitude as one way to help us become more satisfied with what we have and what we have achieved. And I think there’s something to that. Maybe I only feel like my summer has slipped into a black hole of productivity because I never took the time to be grateful for all the little moments it was made of. So here goes: I’m grateful for the bike ride through Brandenburg, where the path was so empty I sang The Mamas and the Papas at the top of my lungs the whole way back from the lake. I’m grateful for the sugared almond ice cream cone that made me look forward to Christmas, and the easy afternoon where David and I sat on a park bench and talked about what it means to have Columbus Day. I’m grateful for the early morning runs Ellen and I took all summer through the Rathaus Park, feeling the heat of the day just beginning to coax sweat. I’m grateful her little dog learned to love me the weekend I watched him, and grateful for how he’d jump onto the bench beside me for breakfast and sleep by my head at night. I’m grateful for the long weekend climbing mountains in Norway, for the piles of pistachios we shucked from our pockets as we clambered over ancient Grecian ruins, for the Eichland with its glowing campfire coals, for the surprise of a Chicago beach. 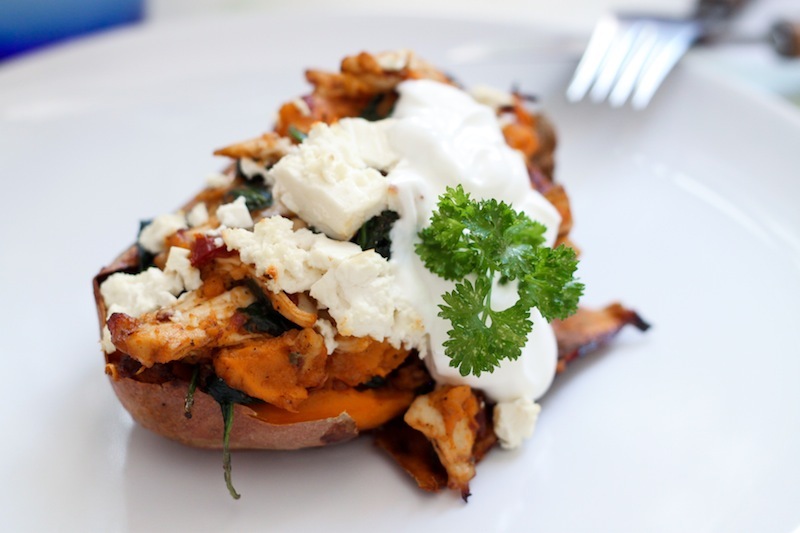 I’m grateful for the questionable fried rice from Ding-Dong my brother brought me when I was feeling particularly bad, for the recipe for sweet potato skins stuffed with chipotle chicken and spinach I found online that made me feel excited about cooking again. The heart of it may just have been a blink, but there are still fourteen more days to join the rest of the stubborn Berliners in making summer last. I’m feeling a little less melancholy already. 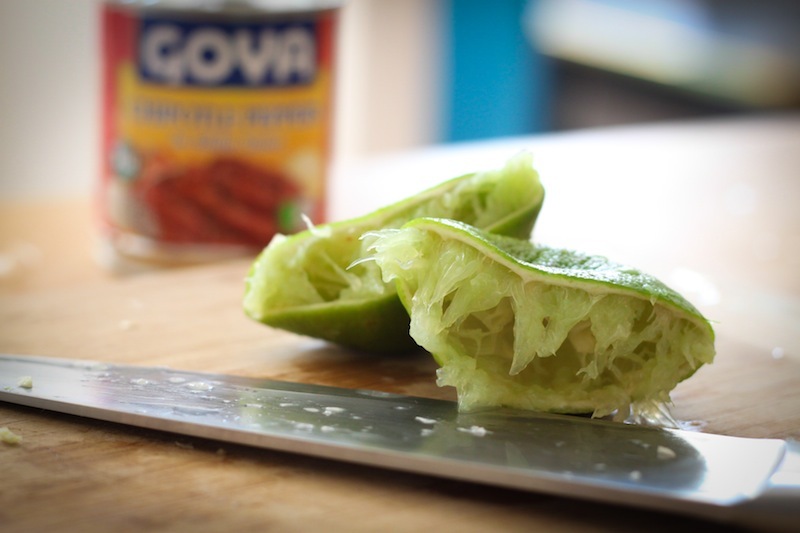 When my mom came to visit me in Berlin a few months ago, she brought me a little can of chipotle chiles. I’ve been hoarding it on the pantry shelf, not wanting to waste it on something trivial. I’m happy to say this dish was totally worth it. 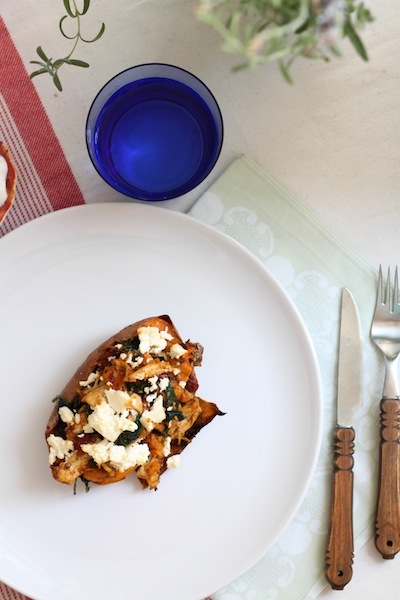 Spicy, slightly sweet, and full of flavor, these stuffed sweet potato skins are also totally healthy and totally filling. Adapted from Half Baked Harvest. Preheat oven to 350º F (180º C). 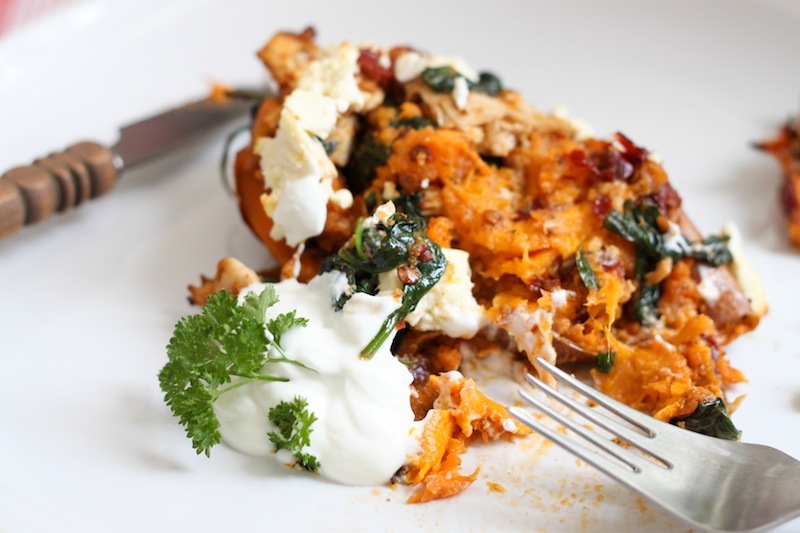 Prick the surface of the sweet potatoes with a fork and bake for 1 hour and 10 minutes, or until tender. 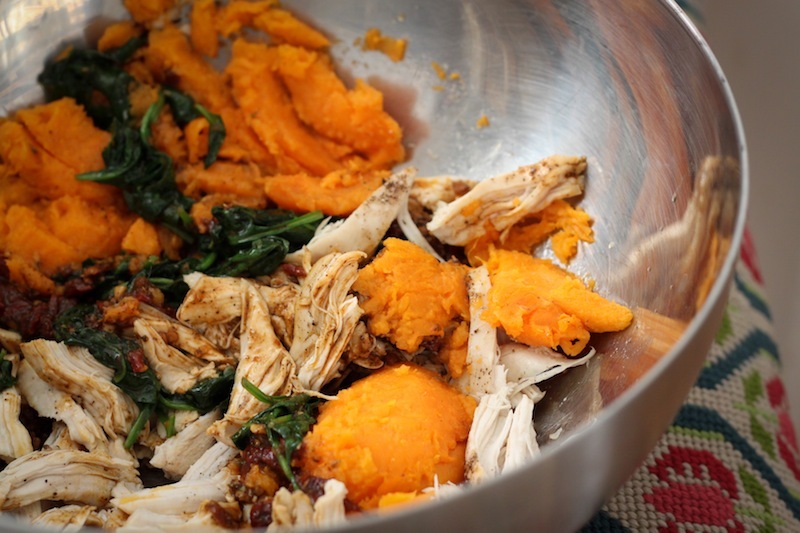 Place chicken in a baking dish and rub with 1 tbsp. olive oil, salt, and pepper. 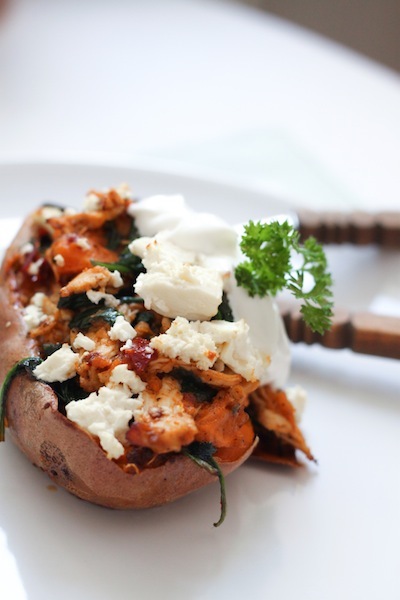 Place in the oven alongside the potatoes and bake for 30 minutes, until cooked all the way through. 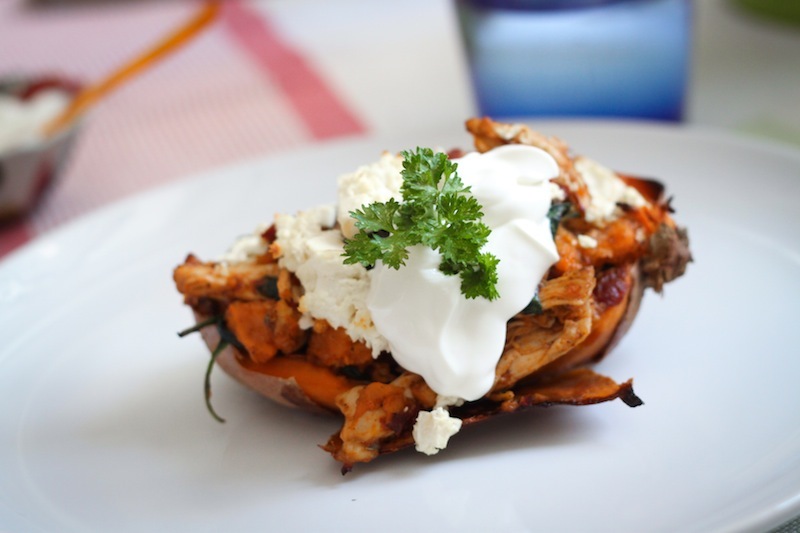 Allow to cool slightly, then shred and set aside. 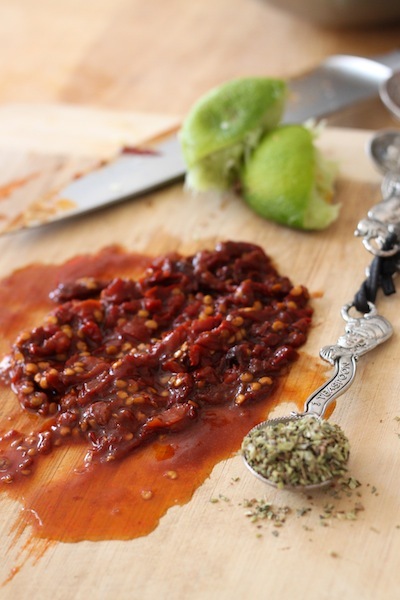 In a medium-sized bowl, combine, ¼ cup olive oil, chipotle peppers, garlic, lime juice, Ancho chili powder, oregano, cumin, and salt. Reserve 2 tbsp. of the mixture, and add the rest to the shredded chicken. 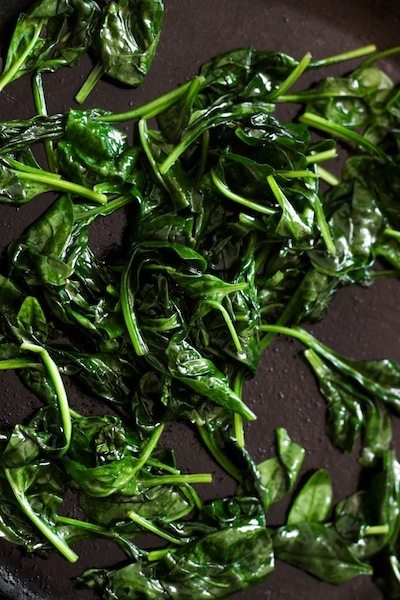 Heat a skillet over medium heat and wilt the spinach. Add to chicken and sauce mixture and stir well to combine. Set aside. 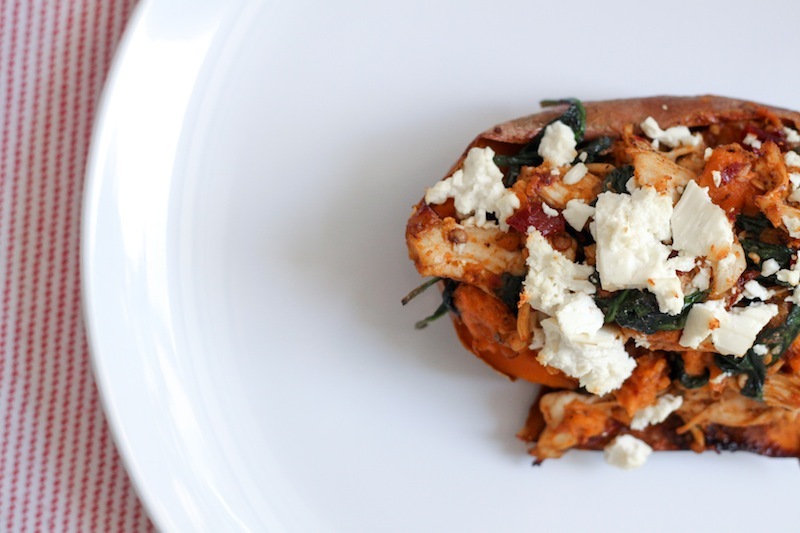 When the potatoes are done, remove from the oven and cut in half. 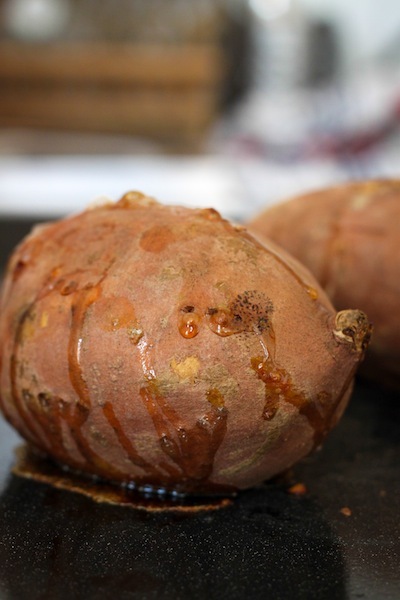 Allow to cool for 5-10 minutes, then scrape out the flesh, leaving a ½-inch layer of sweet potato attached to the skin. Turn oven up to 400º F (200º C). 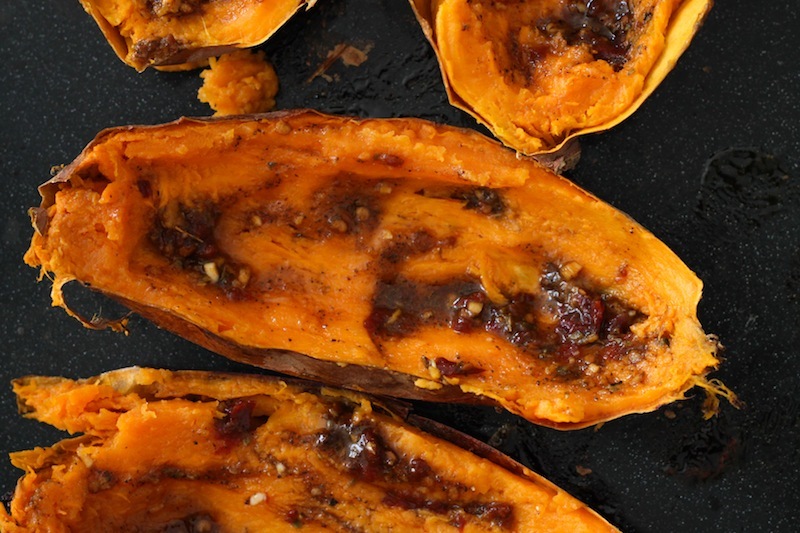 Brush reserved sauce into the sweet potato skins and bake for 5-10 minutes until crisp. 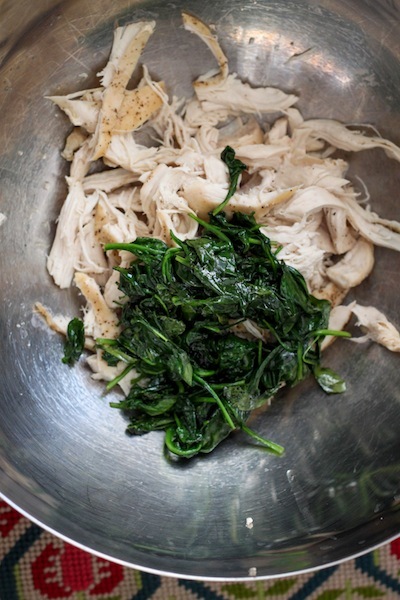 Remove skins from oven and stuff with chicken-spinach mixture. 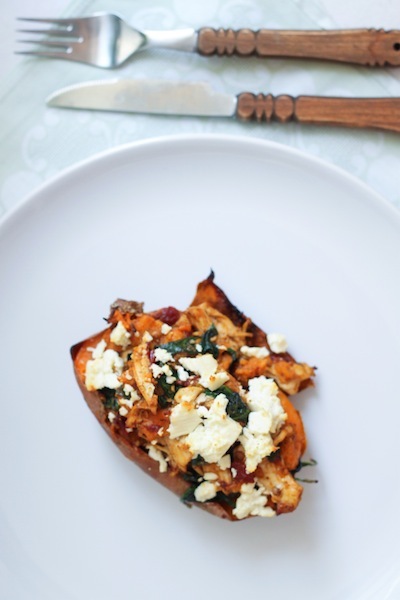 Top with feta and return to the oven for another 10 minutes. 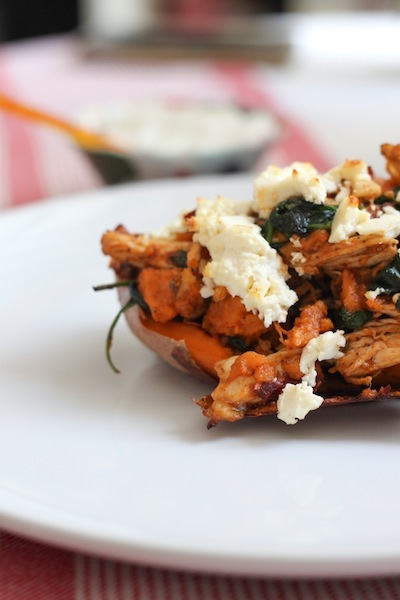 Serve with chopped cilantro and Greek yogurt. Lyz, we are loving your blog. We always love it, but I’m really liking the level of introspection going on… Miss you, and looking forward to Christmas and the Caribbean! Without gratitude, nothing is enough-words that hang still on my refrigerator, posted there in a period of wanting. Awesome! You’ll have to let me know how it turns out.